When it comes to hybrid smartwatches, Fossil's cohort of brands has led the way in the style stakes – but perhaps none as impressively as the DKNY Minute. The supremely thin and light hybrid smartwatch packs activity tracking and smart button functionality, in a case that's the fraction of the size of its rivals. Its 38mm case is just 10mm thick, and even more impressively, carries a price tag that starts at just $155 and rises to a top-end of just $179. 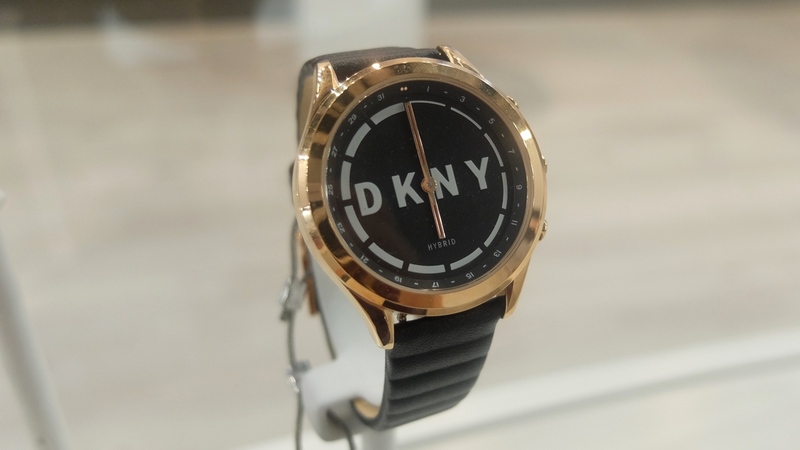 DKNY has instantly made an impact with its first smartwatch and it looks like we can expect a series of connected styles too. The DKNY Minute is a part of Fossil Group's huge push to smarten up its line-up – an initiative that's given birth to nearly 200 devices over the last year. Brands from Michael Kors to Tory Burch have all got involved. The diminutive DKNY we got to look at isn't particularly elaborate. A slight detailing on the bezel adds a touch of interest, but other than that bling is kept to a minimum. There are a host of leather strap options, all interchangeable, held in by a sliding catch between two delicate lugs. Unlike most hybrids there's no inner dial to show goal progress. While that makes for a hybrid smartwatch that's impossible to identify as such, it makes it less useful for those genuinely serious about hitting their goals, although a push of one of the DKNY Minute's buttons will summon the hands to display your progress like an improvised dance. In the background are the same tracking smarts found on significantly larger hybrids in the Fossil smartwatch stable. You get step and sleep tracking, both of which are synced into the customised DKNY app. The buttons on the side – "pushers" as they're known – can be customised to control different features, with selfies being the obvious marketing favourite, but also music control and find my phone features. But perhaps the best part about DYNY's hybrid is the price. The range starts at just $155, and that makes it interesting for a couple of reasons. The first is that in terms of both price and design, there's no compromise. DKNY has managed to build something both desirable, smart and affordable. It's perhaps a mini-milestone in a journey where all watches have smart options, something Fossil Group is already pursuing with its plan to make all Michael Kors' men's watches smart in some way. The DKNY isn't scheduled to land until the "holidays", but watch this space for further updates.